Bring flickering candlelight to your walls with one of our candle sconces, available in country, primitive, and farmhouse styles, by Colonial Tin Works, The Hearthside Collection, Abbott, Market Street, and more! This metal taper holder has an aged, gray finish and is accented at the top with a beautiful heart shape. 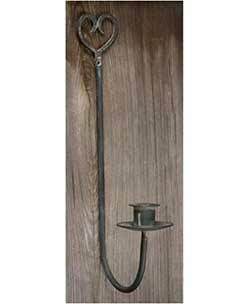 Wood Corner Candle Sconce, by The Hearthside Collection. 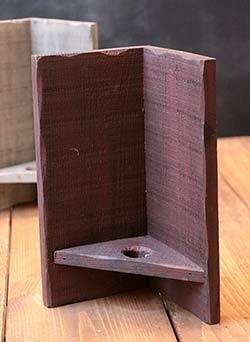 Country-prim wooden corner candle sconce, designed to hold a battery taper candle! This is for the dark, antiqued cream/oatmeal color. Measures 9 inches tall, 6 inches wide, 4 inches deep. Other colors and style also available, as well as battery tapers! Wood Corner Candle Sconce, by The Hearthside Collection. 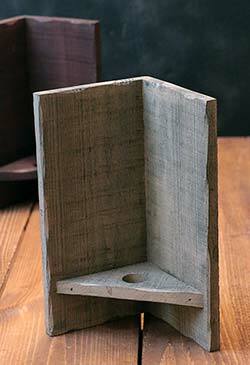 Country-prim wooden corner candle sconce, designed to hold a battery taper candle! This one is Burgundy. Measures 9 inches tall, 6 inches wide, 4 inches deep. Other colors and style also available, as well as battery tapers!